Scrap Tire Reuse: An Environmental Success Story? A new USTMA report shows that in 2017, there were roughly 60 million tires in stockpiles compared to 1991, when there were more than one billion. Today, more than 81 percent of scrap tires are reused. Today, four in five scrap tires are repurposed into some kind of a product after their lifecycle. That’s a reuse rate unlike almost any other material—glass, plastic or aluminum, or even other types of products like mattresses or carpeting. That’s according to John Sheerin, director of End of Life Tires at the U.S. Tire Manufacturers Association (USTMA). Sheerin is the primary author of a newly released “U.S. 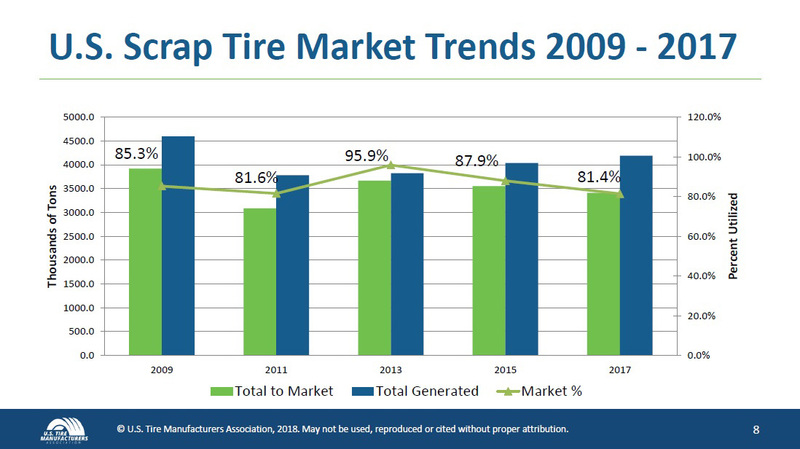 Scrap Tire Markets 2017” report, a bi-annual evaluation of how scrap tires are managed in the U.S. The report shows that in 2017, there were roughly 60 million tires in stockpiles, a 94 percent decrease from 1991, when there were more than one billion. Now, more than 81 percent of scrap tires are reused in products such as tire-derived fuel, rubber modified asphalt and other products, according to the report. During a conversation with Waste360, Sheerin says that the primary use for scrap tires is tire-derived fuel. 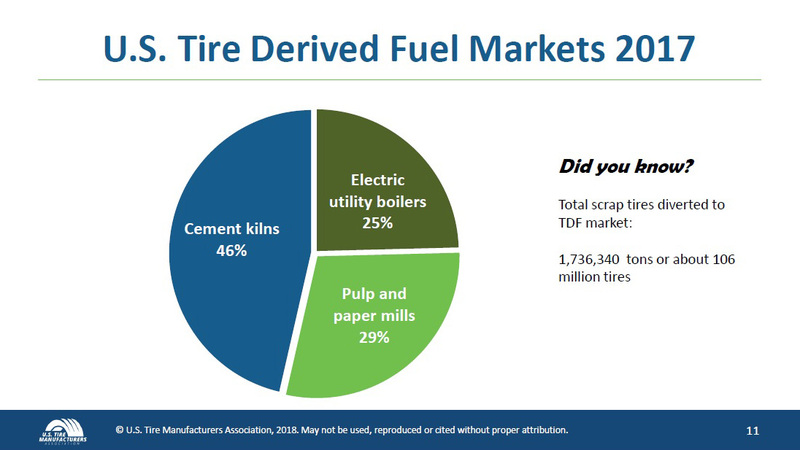 Tire-derived fuel, which is used for industrial purposes, consumed about 106 million scrap tires in 2017, according to the report. Sheerin adds that scrap tires burn cleaner than coal and most other fossil fuels, as they have a high BTU value. Rubber modified asphalt, another key growth area for scrap-tire usage, can be used to build safer and more durable roads than other traditional types of asphalt. In addition to rubber modified asphalt, Sheerin notes there are additional markets to make products out of molded and extruded ground tire rubber material—landscape and playground mulch, synthetic turf and other types of sports surfacing. 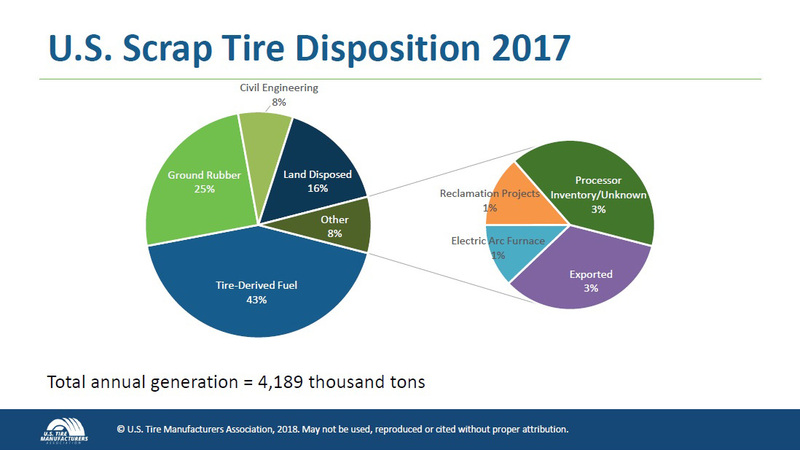 According to Sheerin, the third largest market for scrap tire reuse has always been in construction applications and in civil engineering type applications, where the tires are used as a lightweight fill or for drainage type purposes. Over the last couple of years, there has been an actual decline in the use of tire-derived fuel, notes Sheerin. And the demand for tire-derived fuel or other products expands or contracts over time due to a whole variety of economic forces. However, Sheerin stresses that over the past couple years, USTMA has seen a modest decrease in the use of tire-derived fuels, predominantly due to the price competition from natural gas. The highest use of scrap tires in 2017 was for tire-derived fuel at 43 percent. The use of tire-derived fuel in cement kilns has continued to increase, paralleled with a strong performance of the construction industry. Rubber modified asphalt is a cost-effective product that consumed more than seven million scrap tires in 2017. It is an environmentally friendly alternative to traditional road paving materials. Molded and extruded products, such as mats, garbage cans, flooring and landscaping, and playground mulch are top reuse applications in the ground rubber market. Sheerin notes that new technologies are continuing to become commercialized. Pyrolysis, for instance, is the heating of tires in the absence of oxygen to make new materials, such as fuel oil. There is also a new product that has been around for a few years called flexible pavements, he adds. With flexible pavements, Sheerin explains pieces of tire are combined with rocks or aggregates and a binder like a polyurethane to make a flexible, porous surface so that rain water goes through it and it can bend with movements in the ground—say from tree roots or tree wells.